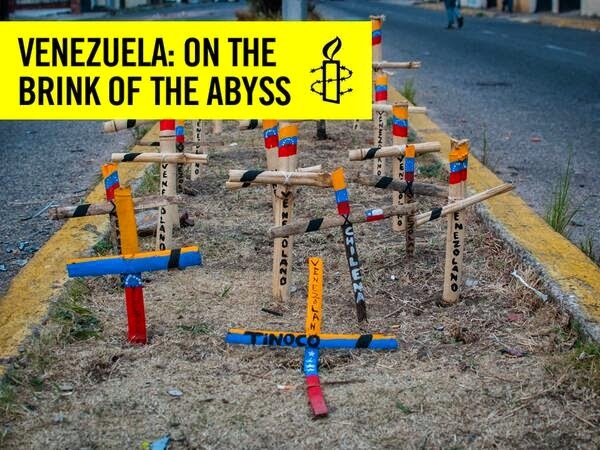 Amnesty: 37 dead, 500 injured and 2,000 detained - Venezuela must put the rights of the people first. Sign this petition to call on the Venezuelan government to investigate and prevent further human rights violations and abuses in the context of protests and open a dialogue with all parties to find an agreed solution. Since the beginning of February 2014, Venezuela has been shaken up by violence triggered by demonstrations against and in favour of the government. The unrest has already resulted in the death of over 37 people, including at least six members of the security forces. More than 500 people have been injured and over 2,000 have been detained. Most people arrested have been conditionally released pending investigations but they face charges that could lead to years in prison. There are indications of excessive use of force by the security forces, as well as reports of violence by armed pro government groups and by anti government protesters. Some detainees have reported ill-treatment and torture. Over the last decade, Venezuelan society has been increasingly divided by polarization. The current political crisis risks undermining any progress made in recent years in standing up for the rights of those most marginalized in the country. This must be a wake-up call for the government. The answer to this crisis is the unconditional respect for the human rights, and the strengthening of the institutions that underpin the rule of law. The time to act is now.